A medium-large sized vulture which grows to 55-65cm in length, it has a characteristic silhouette with wide wings, and a 155-170 cm wingspan, with a rhomboid tail. Its plumage is mainly a light grey-whitish colour that spreads uniformly throughout the body except for the primary and secondary feathers which are black. It’s well known for its yellow face with its black tipped thin and curved beak, long lancelet feathers which cover the distal part of the head and the neck. In flight, its silhouette is easily identified with broad wings, pinkish un-feathered feet and rhombus shaped tail. The juvenile plumage is primarily dark brown mixed in with the adult plumage as they moult their feathers. Habitat: In Europe, the Egyptian vulture is a migratory species which spends its winters in Sub-Saharan Africa and returns to reproduce, across the Strait of Gibraltar at the beginning of March. There are sedentary populations on the islands of Menorca and Mallorca, as well as an endemic subspecies of the Canary Islands known as guirre (Neophron percnopterus majorensis). The Iberian migrants return to their winter homes at the end of September. Most of the population concentrates around rocky mountain cliffs and river ledges, where they nest surrounded by open areas in which they search for food. Nutrition: Scavenger species which meticulously explore their territory in search of carcasses of small and medium size animals, they occasionally capture small vertebrates and insects. When they appear at a site where other vulture species are feeding on a carcass, they tend to stay in a peripheral position just moving on to make the most of the scraps left by larger vultures. Their beak is long and thin, less robust than that of other species so they can’t tear apart the skin of larger animals, so instead they wait for the larger vultures to do this work, moving on later when they can reach into the softer parts of the body within. After rearing their young, some populations form large colonies are associated to dunghills or farms. Daily trophic needs: Estimated at 236 g/day for an adult individual. 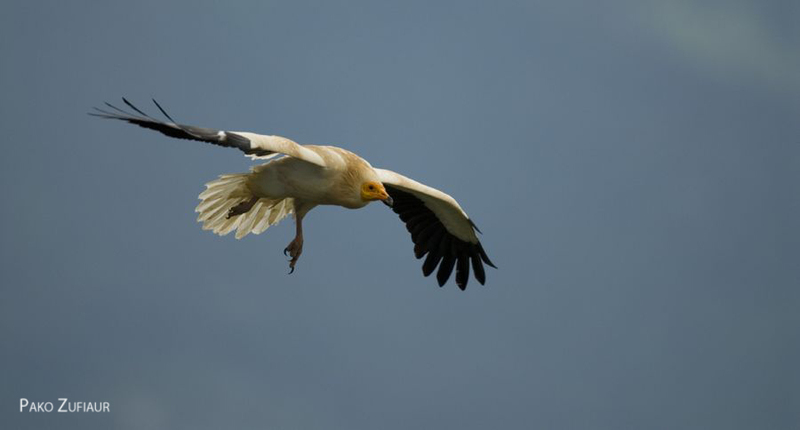 Reproduction: The Egyptian vulture starts reproducing after arriving from its wintering grounds in the Sahel (Senegal, Mali, and Mauritania) in February. They tend to occupy the same nesting grounds year after year. Upon arrival they immediately prepare the nests, which they build into small cavities, caves or cracks in rocky cliffs. After laying the eggs the incubation lasts up to 42 days, after which one or two chicks are born, these will stay in the nest for another 70-90 days, although their presence in their parents territory extends for another two weeks. There are three recognised subspecies, N. p. percnopterus which reproduces throughout the whole Mediterranean area, Spain, Portugal, southern France, eastern Europe, southern Ukraine, Turkey and the Caucasus, all the way to the Middle East, central Asia, north-western India, as well as the Sahel belt in Africa reaching Arabia and northern Tanzania, where Palearctic populations go to winter. This subspecies is also present year round in the Balearic Islands, Sicily, Cape Verde and Socotra Archipelago in the Arabian Sea. In Spain we also have the subspecies N. p. majorensis endemic to the Canary Islands. 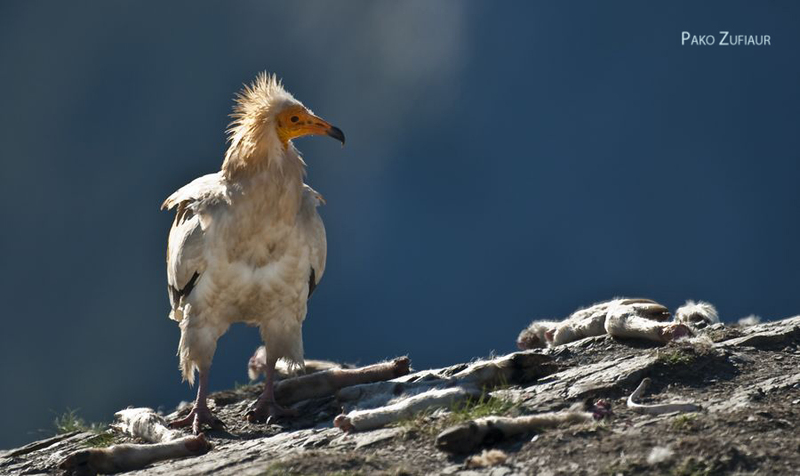 In Spain there are six described locations of Egyptian Vulture species: 1) the Cantabria Range, Pyrenees, Central System and the Ebro Valley, 2) the western part of the peninsula (Extremadura, Arribes del Duero and Sierra Morena), 3) Sierras of Cazorla & Segura, 4) Sierras of Cadiz & Malaga, 5) Balearic Islands, and 6) Canary islands. The population of the species in Spain was around 1.500 in 2008, making up for more than a third of the European population. Regarding Castile & Leon, the region host up to a quarter of the Spanish population (380-422 pairs in 2008), mainly in mountainous regions and rugged river banks in the provinces of Burgos, Salamanca, Zamora, León and Soria. Here, the species is found mainly along the era Cantábrico range in the north of the community, Iberian system towards the east, Valle del Duero to the west, and to less extent in the eastern and western limits of the Central System. The major threats the species currently face include poisoned lures, reduction in the availability of food due to the closure of dunghills and the removal of carcasses from the countryside. They’re also very sensitive to human activity close to their breeding grounds and roosts, and to intoxication due to biocides. Along with these problems they also appear to be suffering from habitat loss in their wintering grounds.